become premium organic mulberry drinks. THE BEST ORGANIC HEALTHY TEA FROM THE FARM TO YOUR HAND. The leaves are well taken care of without using any chemical substances and carefully selected before being process in our own factory, with same production process as green tea. 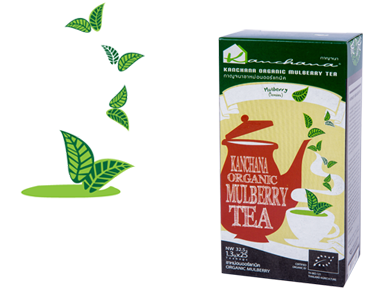 Therefore, Kanchana Organic Mulberry Tea has been certied as organic by domestic and international organic certication agencies, and it has been exported to many countries and regions worldwide. Kanchana Organic Mulberry Tea provides the natural taste, aroma and colour, which make it an excellently refreshing and nourishing drink. Kanchana Organic Mulberry Tea has nearly 200 times less caeine than regular tea. Moreover, it does not have Tannin which is a cause of Constipation. We care for your health, our organic mulberry tea is free of chemical antibiotics, synthetic hormones, genetic modifications. Mulberry Tea has a long history of being the elixir of life among other various medicinal herbs. The Chinese original academic herbal book “Shin Nou Honzou Gyou” introduced the medicinal ecacy of mulberry leaves, roots and barks. 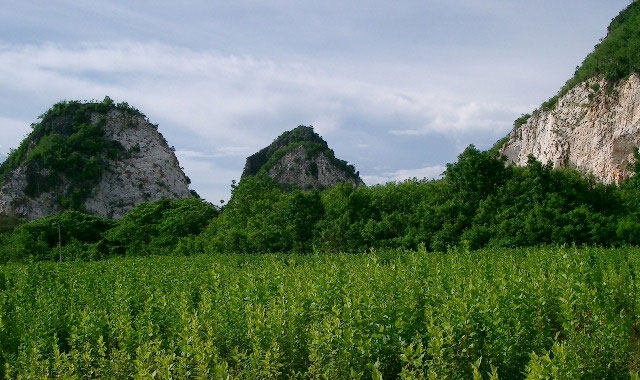 For instance, according to the book, dried leaves were called “Shin Tea,” and regularly taking the tea is good for coughs and pertussis, and for the prevention of hypertension. It can also be a nutritional tonic. In Japan, the original tea book as well as medicinal book called “Kissa Youjouki” written by Eisai Zen Monk (A.C.1144-1215) described the eect; mulberry gruel and mulberry hot water show the eect in a few days for “drinking water disease” (probably diabetes). Aids absorption of food into body through the small intestine while remaining in their natural condition. From the research done by Thai and Japanese scientists, they found that mulberry leaf also contains more useful vitamins and minerals than tea leaf such as Calcium, Potassium, Magnesium, Iron, Vitamin A, Vitamin B and essential amino acids. In addition, mulberry tea has nearly 200 times less caeine than tea, and it does not have Tannin which is a cause of constipation. *Wiroje Kaewruang. 2000. Mulbery Leaf Tea. Sericulture Research Institute Department of Agriculture, Thailand. Our organic farming works in harmony with nature rather than against it. We strongly believe that pesticides does not solve the pest problem. 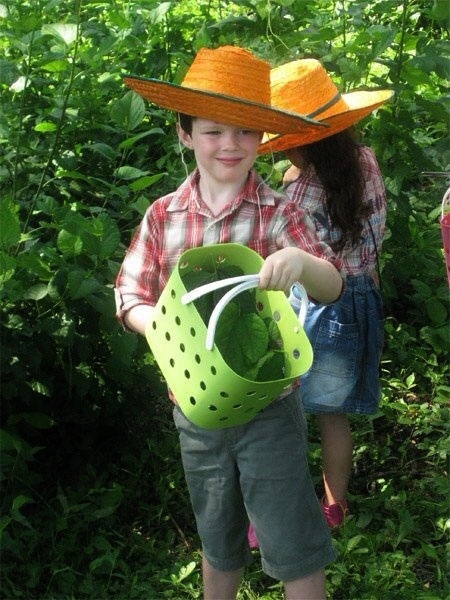 Thus, we combine tachniques by using range of organic methords such as crop rotation, composting, mulching, hand-weeding and etc. for maximum benet.
We also use horses as weeders to graze on weeds. Because we care for your health, our organic mulberry tea is free of chemical antibiotics, synthetic hormones, genetic modications, and eld use of sewage sludge as fertilizer. Even oor cleaner used in our factory, is biodegradable and has been apporved by organic certication agencies. Mulberry tea is becoming popular in Europe and America. However, for the mulberry tea to be sold as organic, it must bear a symbol that proves that it is a truly organic. Our Mulberry Tea is certied through Organic Argriculture Certication Thailand (ACT), an independent, organic-focused organization established in 1995 and accredited by the International Federation of Organic Agriculture Movements (IFOAM). We commit to organic integrity in order to ensure that our mulbery tea is truly good for your health. We can do OEM products under your brand name with your own brand label and packaging.